The Warwickshire man, who has chosen to remain anonymous, bowed out of the 5,000-1 wager on Saturday. Hours later his stake would have been worth £91,000 after the Foxes beat Watford 1-0, said Ladbrokes. The winner said: "It will mean so much if we win, so there's no point in being greedy." He said he was "ecstatic" and looking forward to the rest of the league whatever the outcome. "The odds are constantly changing, even Chelsea could sneak into the top four at the last minute," he said. "A holiday to Spain is a certainty followed by paying off the mortgage with the winnings." Jessica Bridge of Ladbrokes said: "It's a life-changing amount of money and we congratulate our customer for holding his nerve this long." Leicester City still have nine games left of the season, starting against Newcastle on 14 March, to secure their first ever top flight league title. Odds on them winning the Premier League title are now 5-4, said Ladbrokes. 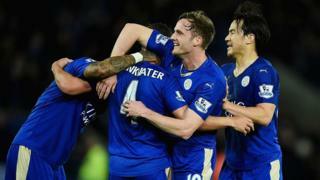 It comes a week after Leicester city John Pryke cashed out his bet for nearly £30,000.